If you are currently looking for a rewarding job in a growing field, have you considered a dental hygienist career? It is an area that offers well-paid jobs, some flexibility with part-time work, and an impressive growth outlook for the future. Also, dental hygienists help improve their patient’s oral health, which in turn improves the patient’s overall health. Here is some information to see if a career as a dental hygienist might be right for you. Helping patients maintain good oral hygiene is a core component of the dental hygienist’s job. First of all, they focus on cleaning teeth by removing tartar, stains, and plaque with a variety of hand, power and ultrasonic tools. After the cleaning, a hygienist may apply sealants and fluorides to protect teeth. Working under the direct supervision of a dentist, the hygienist can perform certain teeth whitening procedures. Hygienists will take x-rays, evaluate the patient’s overall oral health and share that information to the dentist. They also help educate their patients on proper oral hygiene techniques. What Skills Does a Dental Hygienist Need? Being personable is an important part of the job as some people may be anxious going to the dentist. Consequently, having a positive attitude and enjoying working with people sets the right tone for the patient’s cleaning. Being able to listen to your patient and make them feel at ease is paramount, as is being able to talk to patients and teach them how they can take better care of their teeth at home. To have a dental hygienist career, you must have remarkable attention to detail and stamina. You also must be able to work with an array of tools in the patient’s mouth and be able to operate an x-ray machine too. What Type of Education Is Needed for a Dental Hygienist Career? 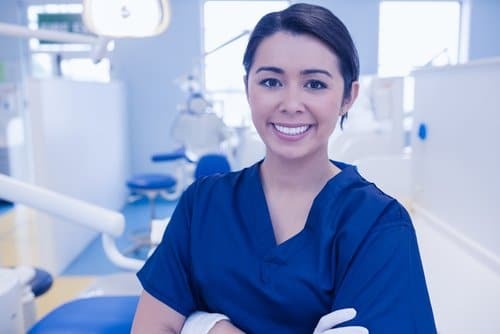 If you want a dental hygienist career in Florida, you must be at least 18 years of age and graduated from a dental hygiene school or college approved by the Florida Board of Dentistry or accredited by the American Dental Association. Alternatively, you may be accepted if you graduated from an unaccredited dental college or school but has completed four years of postsecondary education and a dental school diploma. How Long Does It Take to Graduate from the Program? It typically takes students two years to complete an associate of science degree in dental hygiene, but the exact amount of time can vary by school. Students take coursework in a specific order, focusing on topics such dental anatomy, dentistry supplies, oral histology, radiography, pharmacology and preventative dentistry in the first year of study. By the second year of study, the curriculum shifts from the classroom to laboratory and clinical settings. Broward College in Fort Lauderdale: Florida Southwestern State College in Fort Meyers; Indian River College in Fort Pierce; Miami Dade College; Palm Beach State College in Fort Worth and South Florida State College in Avon Park. Are There Any Other Requirements to Become a Dental Hygienist? After graduation, you will have to obtain licensure from the Florida Department of Health. Candidates must successfully pass the Dental Hygiene National Board Examination, the ADEX Dental and Licensing Examination and the Federal Laws and Rules Examination. Additionally, Florida hygienists must have current proof of First Aid CPR training. Dental hygienists in Florida make an hourly mean average of $30.47, or an annual mean average of $63,370. If you focus in on the West Palm Beach Metropolitan Area, the salaries increase to a mean average hourly of $34.96 and mean average annual of $72, 720. The mean is considered the average of all wages; dental hygienists with college degrees and years of field experience will have higher salaries. Also, about half of dental hygienists work part-time, some may opt for the flexibility part-time work provides. Whereas others choose to work with two different offices for a closer to full-time salary. What Is the Career Outlook for Dental Hygienists in Florida? Pardon the pun, but the outlook for dental hygienist careers in Florida is bright! Currently, over 200,000 dental hygienists work in the US. The United States Bureau of Labor Statistics cited that in 2015, the number of dental hygienist jobs in Florida was the fourth highest in the US, behind only California, Texas and New York. Therefore, there are a considerable amount of dental hygienists employed in Florida, approximately 10,500. Also, the projected job growth outlook for this career is at 19%, which much faster than other industries. Do you still have questions about what it takes to have a dental hygienist career? If so, why not ask one of our dental hygienists firsthand at your next teeth cleaning? They’ll be happy to share their career experiences with you and answer any questions you might have. You can call (561) 272-8555 to schedule an appointment.